SwimOffice lets you restrict meet declaration to certain Billing Groups or Roster Groups/Locations, along with only emailing those groups you select. Add a new event, or click [Edit] below an existing event. Scroll down to STEP 6: Choose which Groups of Members will receive e-mail notifications of this event. Select the check box Also, restrict declaration to ONLY the groups defined below. Select the 2nd or 3rd radio button to restrict entries to either certain Billing or Roster Groups/Locations, respectively. For Billing Groups, click Select to the right of the Billing Groups field, select the desired Billing Groups and click Select. 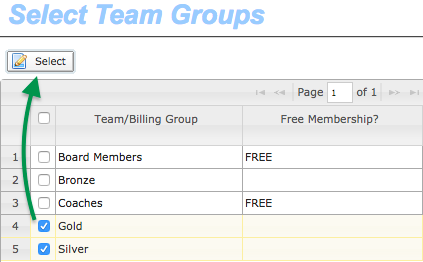 For Roster Groups/Locations, click Select to the right of each, select the desire groups and click Select. All other groups will be excluded from entering this event. Note: You, as an admin, will still be able to sign up those who are in restricted groups. Only non-admins will be restricted from doing so.